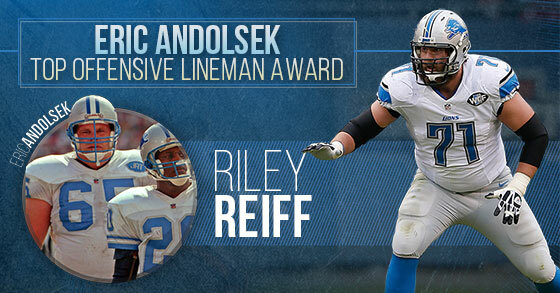 Tackle Riley Reiff was named the Eric Andolsek Top Offensive Lineman Award winner by his teammates. The Eric Andolsek Award is presented to the team's outstanding offensive lineman. This award is given in memory of the Lions' Eric Andolsek, who was emerging as one of the top young guards in the NFL when he was killed tragically in an offseason accident in 1992. He started every game from 1989-91, making his 50th consecutive start in his final contest, the 1991 NFC Championship Game. He was named to the USA Today's All-Pro Team that year, his first such honor as a Lion. Reiff led the Lions with 1,138 snaps in 2015 according to Football Outsiders. He was the highest graded Lions offensive line starter by Pro Football Focus. He recorded the sixth-highest run-blocking grade among tackles by PFF. His 8.9 run blocking grade was the highest on the team from PFF. The six penalties called against him were the 7th fewest by any tackle that played as many snaps as Reiff in 2015.